Honduras hasn’t had a very good year. Thousands of Hondurans, many fearful of their safety, have fled their homes in search of better lives. The U.S. Department of State’s advisory still strongly urges people to reconsider traveling there due to crime. While the country’s new digital tourism campaign, “You Can’t Leave Honduras Without Really Knowing Honduras,” simply won’t work if tourists won’t even consider the Central American country. There is a bright spot, though. The Bay Islands have largely avoided the violence that’s plagued the rest of Honduras. Distance is one of the reasons that the group of islands is considered a haven. They lie 35 miles north of the mainland in the Caribbean Sea. History has played a role, as well. The three main islands—Roatán, Guanaja, and Útila—were first discovered by Christopher Columbus during his fourth and final voyage to the Americas in 1502. But it was England, not Spain, that settled the islands. They weren’t ceded to Honduras until 1859, giving them a different culture and language from the rest of the country. Guanaja is considered the forgotten Bay Island. The 11-mile-long island is covered with rolling hills and evergreens. A canal, called the Cut, separates the southern tip of the island. Most of the population lives on stilted houses on Guanaja Island off the southeast coast. Lots of smaller cays line the rest of that coast. While 90 percent of the land and its surrounding waters have been declared a national forest reserve and marine park. Guanaja was even poised to become the next Roatán in the 1990s. Then Hurricane Mitch destroyed much of the island. It’s taken years to recover. 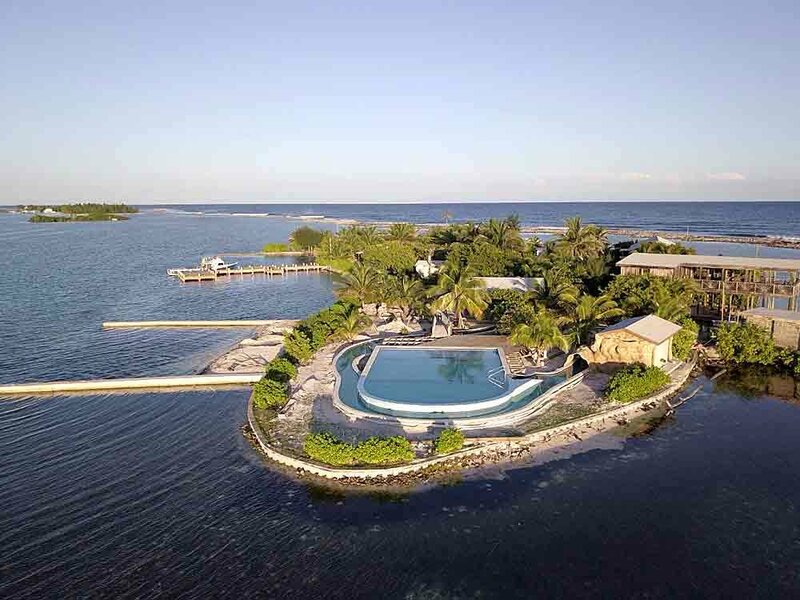 One of those offshore cays, Clark’s Cay, is a private island getaway. The all-inclusive resort reopened earlier this year after substantial renovations and the addition of an open-air restaurant and bar, an infinity pool, and a spa. Simple cabanas feature wraparound porches and king beds. There’s a special “drink of the day” during happy hour. A lazy river rings the pool. Plus the tucked-away spa offers ocean views with its massages. But the heart of the resort is actually the dive shop. Two custom-built dive boats, the Freedom and the Endeavor, depart for both morning and afternoon dives each day. They visit more than 50 dive sites, including six that are kept a secret for their guests, around the island. The Pinnacle attached with black corals. The Jado Trader, a sunken refrigerator freighter. Black Rock Canyons, a conglomeration of caves, tunnels, and deep crevices. This is how you should get to know Honduras.